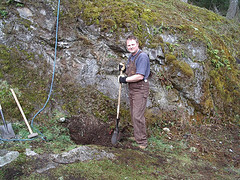 Mark digging Originally uploaded by thesnodgrass. The newest project is to build some steps up the side of this rock. From the top of the rock you can see over the roof of the house to the sea.Im digging the foundations for some concrete pads to build upon.My next door neighbour-but one, Trevor, is supervising the work, and Im doing it. I can hardly believe it, nor can Maureen, my mother in law, who remembers the balls-up of a bath panel I made. She sent me some birthday money which went towards the snazzy overalls Im wearing.